A railway civil engineer specialises in the design, construction and operation of all types of railway systems, which may include main line, metro, light rail or high-speed rail. 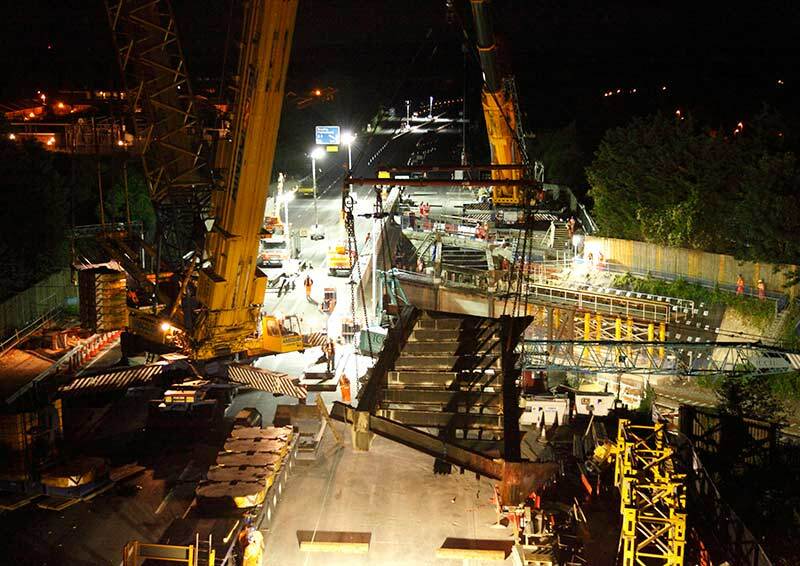 Engineers at work on the Western Region rail bridge replacement scheme. As a Railway Civil Engineer, you could make a great contribution to transform Britain’s rail infrastructure and work on some of Britain’s most impressive projects, like HS2 or Crossrail – currently Europe’s largest civil engineering project. You could have the opportunity to obtain experience throughout the project lifecycle, including feasibility studies, site investigation works, outline and detailed structural design, construction and commissioning. You could be working on anything from small-scale improvements to £multi-billion projects. The work is varied, but you will seldom find yourself working alone, so enjoying being part of a team is very important. You may find yourself in small teams of designers or in large project teams with other engineers, constructors and specialists. You could be developing new products or innovations, maintaining or renewing part of the railway system or engaging in a construction project. Railway civil engineers often take responsibility for safety and for bringing together the work of other engineers, with responsibility for delivery to cost and time targets. Project can vary in size from a footbridge replacement during a weekend rail closure through to installation of a new electrical or signalling centre, development a tramway for an urban conurbation or planning a new metro. Although the UK's rail networks have existed since the 19th century, and you will be following in famous footsteps, the sector is continually innovating and adopting new standards and techniques. Remote monitoring of equipment and the use of software simulation to solve reliability and design challenges are commonplace and the sector exports its knowledge all around the world. There are opportunities to learn languages and to live and work abroad, either with consulting or contracting companies. There is always a business need for improved performance in the rail sector, and engineers are encouraged to create solutions that embrace technology, and to find ways in which the railway network can be maintained, renewed and expanded, whilst ensuring that a safe and reliable service is always available to passenger and freight customers. Whether high-speed, metro, light rail or main line, there are many, diverse career opportunities in railway civil engineering. As part of a major investment programme, there is now unprecedented demand for the engineering skills that are required in the UK over the next decade. The sector plans to double the number of people with engineering qualifications. High Speed 2 (HS2): high-speed railway to link the cities of London and Birmingham, followed by further extension to the northeast, northwest and Scotland. Design is underway and construction of the first phase of HS2 is set to begin in 2017, opening around 2026, with completion of the network expected around 2033. Crossrail and Crossrail 2: Crossrail will link Reading and Heathrow in the west with Shenfield and Abbey Wood in the east via major deep tunnels under central London. With the main civil engineering construction works for Crossrail complete in 2017 the railway electro-mechanical systems will be installed and tested, the fit-out of stations will be underway and commissioning will complete the essential safety tests before operation can commence. Great Western main line electrification:The electrification of one of Britain’s busiest and oldest railways will enable new trains to improve comfort and journey time between major towns and cities across southern England and South Wales. The Northern Hub: An integrated programme of targeted investment to the railway in the North of England will allow up to 700 more trains to run, each day, and provide space for 44 million more passengers a year, bringing massive improvement in public transportation. How do I become a railway engineer? A Bachelor's degree in Engineering is required, such as Civil Engineering or Civil Engineering Technology. Some universities offer specialist courses, which can be an advantage if you know your preferences; others offer more general degrees that specialise later. The railway needs all types of engineers, especially those with good inter-personal skills, awareness of safety and a willingness to accept responsibility. The national operator of railway main line infrastructure is Network Rail. To participate in their Graduate placement programme, Network Rail advises that you need to be logical thinker who is adept at finding workable solutions to challenging problems. You must have at least a 2:2 in an ICE-accredited degree and be prepared to follow their placements across Britain. Transport for London and HS2 Limited also have major recruitment and training programmes. Other construction and consulting firms, large and small, have graduate and apprentice programmes. How could I return to civil engineering as a railway engineer? Network Rail offers a dedicated Engineering Conversion programme. Over nine months, participants get the training and hands-on experience needed to specialise in railway engineering. Other employers, construction and consulting firms may also be able to offer structured programmes or opportunities to work part-time as a route back to work for those who have been outside the sector. There are a growing number of university courses that specialise in rail engineering or rail systems, including distance learning and part time courses to MSc level. Apprentices will undertake core learning and may specialise in one particular discipline, or have the opportunity to visit a range of workplaces to gain broad experience. The National Skills Academy for Railway Engineering supports apprenticeships in the rail sector. Entering the sector as a technician is a fantastic opportunity to work alongside an experienced and dedicated railway engineering team and a great opportunity to progress your career. ICE offers a recognised engineering technician qualification. Many ICE members have followed this path and gone on to become chartered engineers with ICE. How can I learn more about rail engineering? Delivering infrastructure for less: Effective design and procurement - Examples from projects where progress has been made since the 2010 Infrastructure UK report and where innovations and developments are likely to occur over the forthcoming years.